Today instead of cooking two chicken breasts, some starch, and a vegetable, I made this dish instead. I think it looks pretty yummy. In the time that it took for the water to heat up and boil for the penne, we sauteed the one breast of diced up chicken, mushrooms, onions, garlic, and tomatoes. Then when the pasta was very al dente we tossed it together with the chicken, onions, and mushrooms and some dark salad type greens, added a cup of pasta water and olive oil for a sauce, and garnished it with the sauteed cherry tomatoes, parsley, and Parmesan cheese. 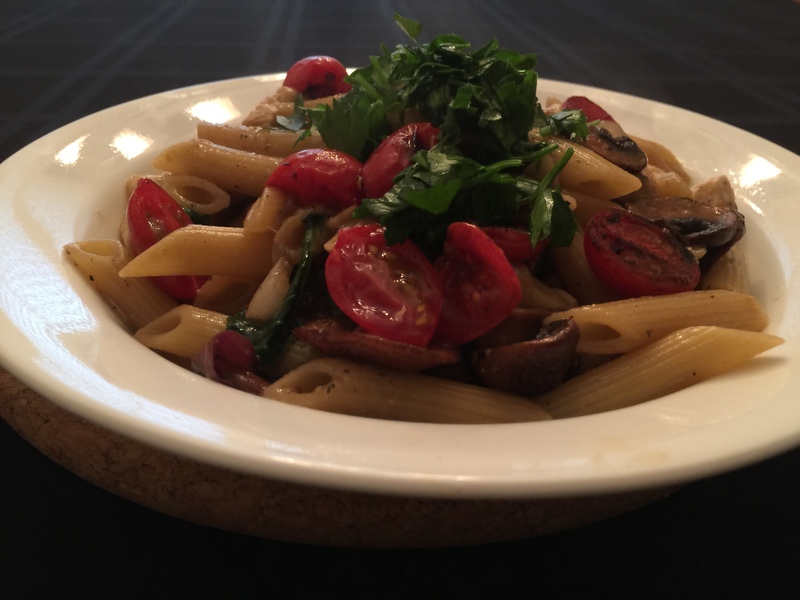 This entry was posted in Pasta, Poultry, Vegan, Vegetables, Vegetarian and tagged Cherry tomatoes, chicken breast, garlic, greens, mushrooms, Onions, pasta, penne, Vegan, vegetarian. Bookmark the permalink.